I suspect that we all have asked ourselves what can we do to be part of a resolution of this crisis. I encourage all of us, first of all, to keep in our prayers the needs of migrants who struggle with a wide range of difficulties. Locally, I have talked briefly with Bishop DiMarzio and the Very Rev. Patrick Keating, who is CEO and executive director of the Catholic Migration Services. Within our own Diocese of Brooklyn and Queens, they have informed me that our diocesan agencies have been unable to resettle refugee families in this area because of the high cost of living here. Some migrant children who were forcibly separated from their parents have been housed in a former convent in the Bronx. 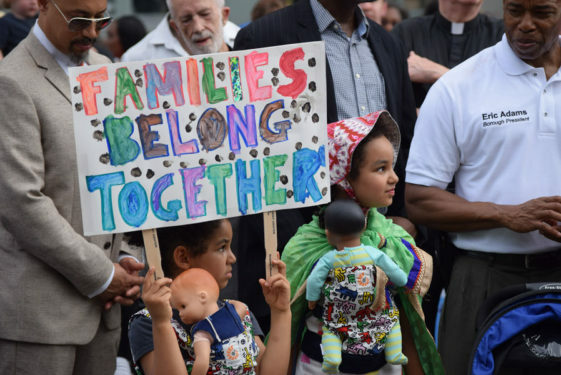 In our diocese, lawyers who work with migrant families and/or children do offer representation to help families with the legal issues that inevitably arise in these matters. The Catholic Migration Services (CMS) website in our diocese invites individuals with specific skills to assist voluntarily the CMS staff in aiding migrants. To access this site, go to catholicmigration.org and click on the drop-down link labeled “Get Involved.” There is also a link labeled “Donate.” Contributions will enable Catholic Migration Services to continue its hands-on work. On a national level, I encourage you to join the Justice for Immigrants Campaign and become part of a network of Catholic institutions and individuals interested in comprehensive immigration reform. There you will find a resource kit from the U.S. Bishops concerning unaccompanied migrant children as well as other important resources. Thank you for your prayers and sacrifices. May we draw from our rich tradition of Catholic and American values and work toward an equitable solution of these complex issues! Photo courtesy The Tablet, from the June 24 strollers march in Brooklyn against border separations.